U21 Championship. 9th round. September 23, 2016. Shchaslyve. Knyazha Arena. Att: 100. 14 oC. One of the league leaders Shakhtar (2nd place, 19 points) entrtained the bottom-of-the-table Volyn (11th place, 7 points). 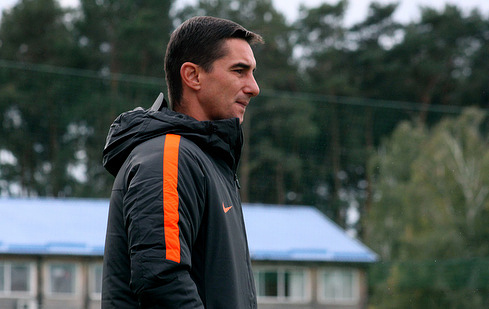 In comparison with the previous meeting, Valeriy Kryventsov made a number of personnel changes. Instead of the injured Oleksandr Pikhalyonok, he fielded Danylo Ihnatenko, coupled with Yuriy Hlushchuk in midfield.Giorgi Arabidze took a place just behind the striker, with Mykyta Adamenko spearheading attacks. With the captain's armband on, the goalkeeper Yevhen Hrytsenko led the teammates onto the pitch. The first thing, the Pitmen dispossessed the visitors, forcing them all to drop deep. Dangerous situations near the Lutsk goal began to emerge from the off. Oleksandr Zubkov found Mykyta Adamenko with his delivery into the box only to see the latter to be denied by the opposing defenders. A similar long pass was made by Arabidze to his teammate: this time Adamenko struck just over the bar. A set piece brought success to the Donetsk team. On 22 minutes, Danylo Sahutkin headed home a left-hand pass to make it 1-0. Less than ten minutes later, Giorgi Arabidze powerfully crossed it into the box from the same wing, with Volyn goalkeeper failing to keep the ball in his hands for Oleksandr Zubkov to fire it home – 2-0. Shortly afterwards, Shakhtar’s number 10 made an assist. After a corner kick by Zubkov, the keeper made another mistake, which was taken advantage of by Mykola Matviienko, who gave the scoreline a lopsided look – 3-0. Before the break, more goals could be scored against the visitors, but attempts by Adamenko and Ihnatenko did not reach the target. And finally, Zubkov tried to bend it into the far top corner only for Khvalytskyi to make a spectacular save. The charges of Valeriy Kryventsov started the second half with powerful attacking moves. Following set pieces, the central defenders Oleksandr Masalov and Danylo Sahutkin posed threat to the goal. And on 54 minutes, Yuriy Hlushchuk hammered a super long ranger into the top corner to make it 4-0. No sooner had Volyn come to their senses as Giorgi Arabidze took advantage of Ihor Kiryuhantsev’s pass to strike it home from some 12-metre range to make it 5-0. However, the Orange-and-Blacks were still not ready to rest. A graduate of Lutsk football school Oleksiy Zinkevych actively joined the game, with his snapping shot almost reaching the target from outside the penalty area. Immediately after that, the opponents might well covert their only chance, but Yevhen Hrytsenko came to the team’s rescue, clearing the ball from the goal line. In response, Arabidze played a double one-two on the edge of the box and struck the ball with his left foot only to see it whizz just inches off the woodwork. On 84 minutes, the Pitmen succeeded at completing a stunning move: Zubkov backheeled it just behind the defenders’ backs, with Mihunov bursting into the box and crossing it to the far post, where Oleksiy Zinkevych smoothly headed it home. 6-0 - Shakhtar thrashed Lutsk-based Volyn, confirming the status of the most prolific league team. In the next round, the charges of Valeriy Kryventsov are to play Zorya Luhansk. - Favourites and underdogs exist only on paper. Before the match, the teams have an equal chance of success. I liked the fact that Shakhtar players had seriously approached this meeting: each of them showed their best qualities on the background of our teamwork, which is very important. They scored six goals, still enjoying ample opportunities to make the score even bigger. I am delighted at the fact that the team score goals, playing aggressively while attacking. And I want to make a special mention of the fact that today’s substitution players proved to be no worse than the starting XI. Hopefully, our players will be equally serious about their performance in the future.